Sweet Sixteen Cake Ideas, Photos & Examples - The Best Cakes Are Here! The cake is an important aspect of the party and should reflect the tastes of the birthday person. 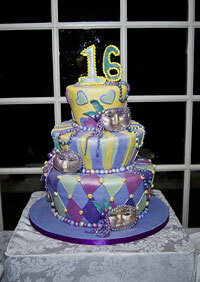 The cake should match within the theme of your sweet sixteen and should say something about you. If you are having a party in a certain theme the cake should fit into the theme and incorporate some of the design elements in the cake. Cakes can be one level, multi-level or you can have multiple cakes! They can feature elaborate decorations showing off your personality and have many different cake flavors. Sweet sixteen cakes can be simple or complex and should be based on the personality and interests of the birthday person. Whether your personality and tastes are chocolate, strawberry, or carrot cake, picking the right cake says a lot about you. Find the right sweet sixteen cake flavor for your cake based on flavor personality profiles. Cake icing is varied almost as much as the flavors cakes and are what separates a boring sheet cake from a sweet sixteen cake masterpiece. Knowing which types of icing there are and which ones would be a good fit for your cake will help you when you meet with your cake vendor. Fondant gives a high end look at a high end price while a traditional buttercream will look good and taste good all the way through. Learn about the different types of icing and decorations used on sweet sixteen cakes. Where Should I Get My Cake? For the best possible results you should look for a local pastry shop or wedding cake shop that can deliver the cake style that you are looking for. A good bakery will be able to find out information about you and incorporate that into the design of the cake. Using sites like weddingwire.com or yelp.com will help you find the most highly rated vendors in your area based on other peoples reviews of their work. 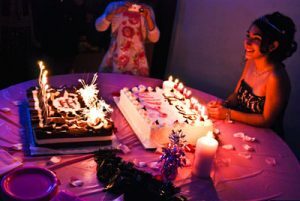 Average Sweet Sixteen Cake Cost? A cake from a reputable baker will cost between $3-$8 per person including delivery and setup. You should be able to go to the shop and have a tasting of the different styles of cakes until you find one that you love. One way to manage the cost of the cake is to have a smaller cake that will be cut and hold the candles that the birthday person will blow out. Then you can use a cheaper sheet cake to feed the guests. High end look for a lot less. A lot of time goes into creating truly wonderful cakes but the result is worth it.